A dive into etcd and the creation of a Python library to manage dynamic configuration are the subject of Gigi Sayfan's latest Write Stuff article. Building robust and performant distributed systems is hard. The main reason is that typically everything is in flux. There is no well defined spec for hardware, software and usage. Everything evolves at the same time. Your system capabilities evolve, if you run in the cloud your cloud provider may change the hardware under you, changes in data volume and user access patterns will push you to new architectural choices, at scale cost of hardware, storage and bandwidth will become the dominant factor and not the people managing your infrastructure. Add to that the dynamic nature of networked systems where component failure is a day to day reality and not a theoretical possibility. Managing that change and turmoil requires some deliberate design decisions. You can't hard-code all this flexibility into your software, which means you'll have to be able to configure it without making code changes. There are several well-known mechanisms to do that such as command-line arguments, environment variables and configuration files. All have their own time and place. But, in a large-scale distributed systems context (think hundreds or thousands of servers) they all suffer from a significant downside. They all require a deployment (if pushing a new configuration file) and/or restarting a process in order to provide new command-line arguments or environment variables. This push-based approach is problematic because it's fragile. Some servers will be down and you'll have to keep track of which servers got the new configuration and which ones didn't. The ones that didn't can create all kinds of issues when they eventually get online and keep running with the old configuration. An alternative approach is a pull-based approach where processes periodically pull from a central configuration repository the most up to date configuration. The ultimate solution is if a process is notified in real-time whenever its configuration changes and can reconfigure itself almost immediately. In this article I'll show you how to do just that and build a dynamic configuration service based on etcd using a Python library called conman. Etcd is a distributed key value store that provides a reliable way to store data across a cluster of machines. It uses the RAFT algorithm and is great at keeping critical data correct and available. You can organize your keys in directories to get hierarchies and get notified when keys are added/removed/changed to directories you watch. Let's play around with etcd to get a sense of how the different concepts work together. You can install a local etcd cluster by following the instructions here for creating a local etcd cluster. etcdctl is your command-line client. You can use it interactively or in scripts, although for serious programming I recommend using a proper etcd client library in your favorite language. I created this alias to quickly connect to my Compose.io etcd instance using etcdctl. Note the --ca-file ~/compose_etcd.pk option. You need to create a file that contains the public key provided to you in the compose.io etcd dashboard. --username, -u - provide username[:password] and prompt if password is not supplied. That's pretty straightforward you can also create (like "mk") or update existing keys with the "set" command. So, etcd looks pretty similar to a distributed file system from an administrative point of view. That's great because you should have a mental model for how to organize information and how to manage it in etcd. Etcd has another cool thing, which is TTLs (time to live). When you create a key you can decide how long it hangs around. There are many situations where you may want keys to expire after a while and with tcd you don't have to implement this logic yourself and remember to delete keys after they expire. ~ > e mk e 4 --ttl "5"
This command will block until some change occurs in the watched key and all its descendents since I specified the "--recursive" option. ~ > e set a "what this." Normally, when you watch a key, you would want to do something when it is modified. The "exec-watch" command lets you execute arbitrary commands when the watched key is modified. I will just mention a few other things etcd provides. 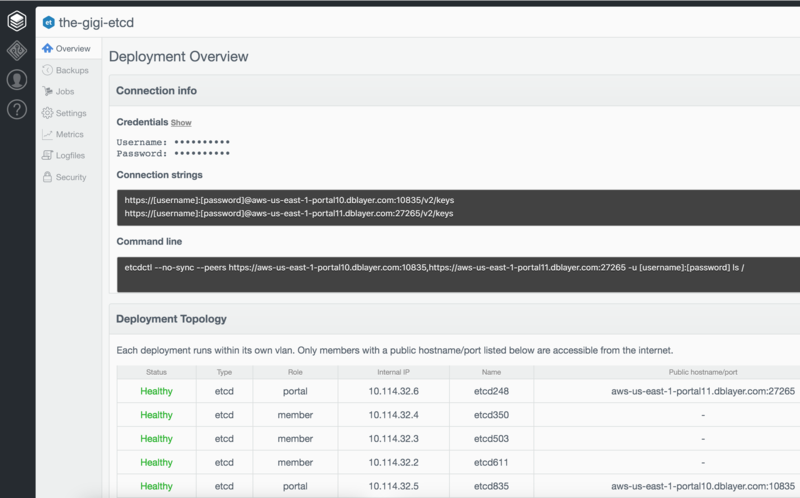 You can manage authentication, users and roles, grant and revoke read/write privileges on a path basis. You can backup and import snapshots and you can manage the members of the cluster. The ConMan library is a Python library for program configuration. It supports configuration files in various formats but most importantly etcd. It is built on top of python-etcd. The ConManEtcd class allows you to connect to an etcd instance and then add keys you're interested in. Then it exposes the key and all its subdirectories as a nested Python dictionary. You can refresh at any point or even watch the key and get notified when something is changed. Good examples can be found in conman_etcd_test.py. The test_refresh() function makes sure that when the data for a particular key is modified on etcd and conman's refresh() method is called the updated data shows up. "self.conman" is a ConmanEtcd object that was created in the setup phase. The "set_key()" method is a utility function that sets keys on the etcd instance. Then, let's add the key to the etcd instance using the setkey() helper. The value is a dictionary "dict(a=1)", so it will actually create on etcd a directory with a sub-key "/refreshtest/a 1". So, the state has changed on etcd, but our self.conman wasn't refreshed since the change, so it should still be unaware of the new state under the "refresh_test" key. OK. Let's refresh and verify self.conman has the new state. Yeah, it worked. But, what if we change an existing key? Yep. The refresh() method of ConmanEtcd works as expected and can sync with the etcd instance. Refreshing state is fine, but very often you want to always work with the most up to date state. You could repeatedly call refresh(), but a much better way is to watch for changes. ConmanEtcd supports the watch functionality with a nice callback interface. dyn_conf_program.py is a complete sample program that is configured dynamically. Whenever the configuration on etcd is changed it gets notified via a callback and writes the change to a file. Finally when a special key called "/dyn_conf/stop" is set to 1 it exits. Let's go over the different aspects of the dyn_conf_program.py program. The whole program is contained in a single class called Program that is instantiated when the script is executed. You need to pass a key to watch and a filename as well as various connectivity arguments, but it connects by default to a local etcd instance. The __init__() method creates a ConmanEtcd object passing it own on_configuration_change() as the on_watch callback argument. It also opens and truncates the file indicated by filename (for testing purposes). It then stores the filename and the key, initializes a variable called "last_change" to None and calls its own run() method. The run() method starts by refreshing the key so it is up to date with the current state then it watches the key by calling self.conman.watch(). Note that this is NOT a blocking call because conman runs each watch in a separate thread. Then the run() method gets into a loop where it is constantly checking if there is a sub-key called "stop with a value of "1" and in this case it returns effectively ending the program. Otherwise, it sleeps for one second and checks conman again. This is a classic example of dynamic configuration where you can terminate the program remotely by setting the "stop" key in etcd to "1". The program is very efficient because it doesn't refresh the entire state from etcd every second. It just checks the state of the local conman. OK. So, if run() checks only the local conman's state and never refreshes how does it know when the "stop" key becomes "1"? That's the beauty of the watch functionality. Whenever, someone modifies the watched key the callback method "on_configuration_change()" will be called. This method is smart enough to ignore redundant repeats of the same change, which can happen in a distributed database like etcd and is hence idempotent. When a new change arrives it writes it to the output file and also does a refresh, so the local conman is up to date with the state on etcd. Etcd is a powerful and very reliable distributed database designed for special use cases. One of these use cases is program configuration. This article explained the need and rationale for reliable dynamic configuration of a large number of programs across a distributed system and introduced a Python library called conman that can be used to dynamically configure your programs remotely. Give etcd a try. It's fun and useful.